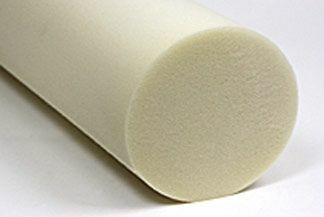 Polyurethane foam is designed primarily for indoor use. Foam retains water and mildews easily, but holds its shape longer, which makes it perfect for indoor bolster pillows that will be used frequently. Foam is easy to cut using a simple box cutter or an electric knife for more precise edges. Our most popular bolster diameter is 7 inches.